Will Tea at Downton Abbey ever be the same again? It is the weekend – hooray! At this point, I am usually looking forward excitedly to having time, tea and well, more tea in all honesty. But there is anxiety for me this week my dears as I dare to broach a rather delicate subject – yes, last weeks episode of Downton Abbey. It all stared so well three weeks ago – the reason we all fell in love with Downton in the first place was exemplified by watching the still grief stricken Lady Mary – which one of us has not felt loss or could fail to empathise with her. I think it is that ability to connect to our common experiences directly through the life of the Crawley’s that is the real strength of its success. However, even the Countess of Carnarvon was a little put out at last weeks episode. Like her, I watch Downton to be enveloped in loveliness, in a world of beautiful frocks and rooms that I would love to be sitting in front of the fire sipping tea from my china tea cup just served by Carson the Butler ( even the Countess is Butler-less these days). It is the world where the distance between the forks on the table matters and you can watch with some amusement the lives and squabbles of the servants. It was all the more shocking then to be knocked from this safe perch, cocooned as I thought I was, into such a horrible situation. I am not sure Downton can ever be the same again and I am saddened by that. I concede that this awful violence has been the experience of some, and I sympathise hugely but it felt entirely out of kilter with the tone of all other Downton episodes. I will watch, tea cup in hand, with some trepidation at this weeks episode. Well, quite honestly, tea was furthest from my mind on this splendid occasion well, as far as it can ever be, then by some serendipitous accident, I stumbled across the closed thing to tea that you were going to find at a cheese show – an afternoon tea made entirely from cheese! 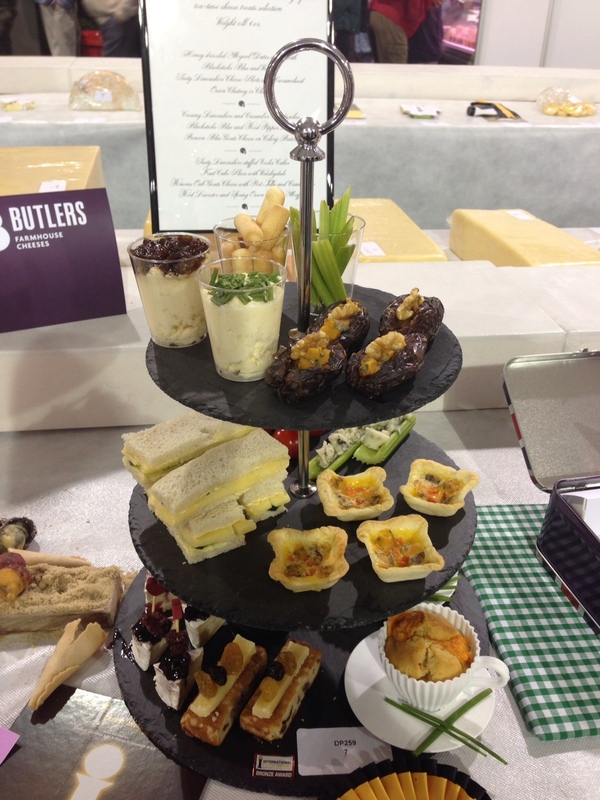 And not just any old cheese, my dears, this was gorgeous Butlers cheese, of Blacksticks Blue fame. As coincidence would have it, the creator of this marvellous afternoon tea happened to pass by as I was admiring its genius – what are the chances of that, really quite extraordinary. Anyway, she took me through the menu. Who could resist honey drizzled mejool dates stuffed with blacksticks blue and walnuts or creamy Lancashire stuffed Eccles cakes. My favourite though had to be the red Leicester and spring onion teacup muffins – so original. All I can say is that this inspiring, sumptuous and entirely cheese focused afternoon tea is going to be recreated very shortly (ahem that’s when I have recovered from a slight over indulgence of cheese – ness) with a nice fragrant brew to accompany it. Thank you to the lovely lady from Butlers. who was so delightful – her cheesy afternoon tea made my visit quite the perfect day. In a freak accident of nature, and unknown for many years, it appears that the UK is actually experiencing warm blue skys that closely resemble summer……of course, we are keeping terribly quiet about it in the vain hope that if we ignore this meteorological phenomenon, it will continue. 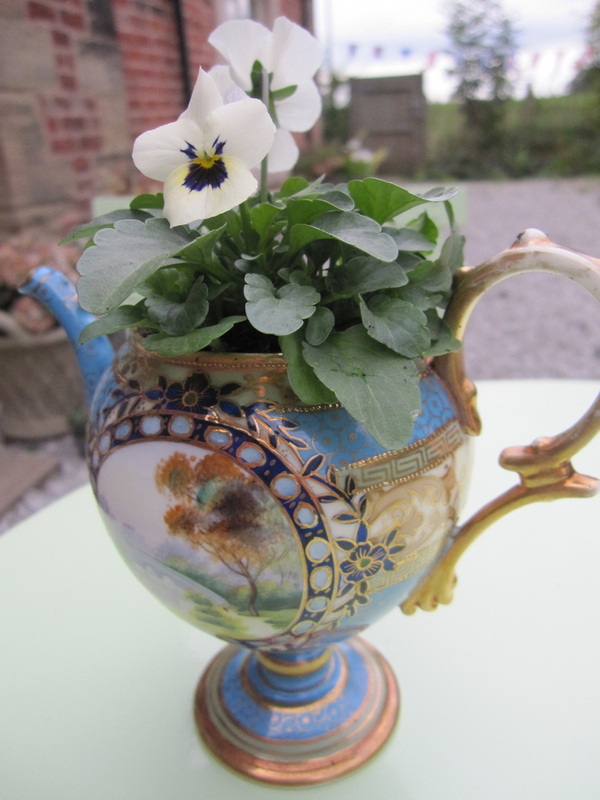 As iced tea has never been something that I have embraced, to celebrate this quite lovely weather, I thought I would create summer in my very own favourite tea pot. I hope you love it as much as I do. It is early but she is already wide awake. Bells in the distance indicate the hour – she knows it is too early to rise but she is restless. A decision needs to be made and she is unable to remember a time when she is so unsure of what step to take. It’s springs to her mind in a rush of consciousness. The noise of the kettle boiling, the hard ceramic contours of her favourite tea pot – already she is starting to feel better. One choice comes easily – Assam, bright and bold. The water hisses on the leaves. 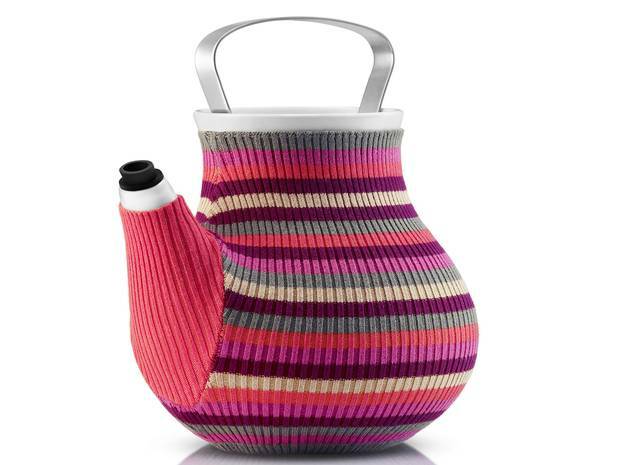 I hold the warm cup inhaling the distinctive aroma – perhaps this choice is meant to savored. Tea and sympathy – all is well. After having watched the emotional race of a lifetime as Bradley Wiggins created cycling history, making a brew was all I could do to calm down afterwards – and oh how I wished I had this historic china teapot to make that celebratory cuppa in. 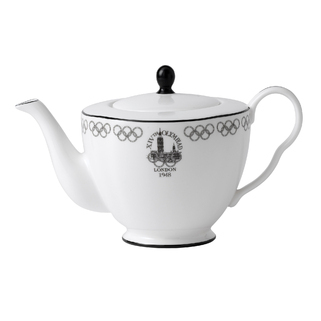 I adore the retro 1948 austere simplicity and the stylish olympic rings decoration at the lid. 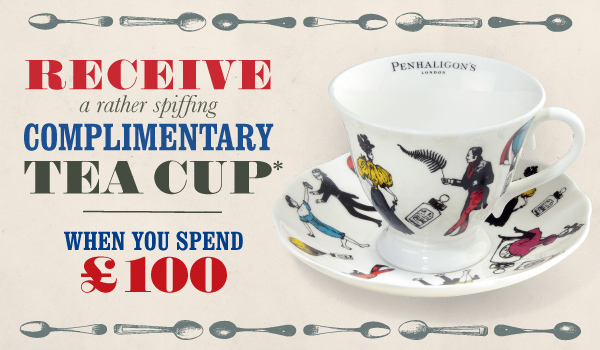 Just the perfect teapot to brew your celebratory cuppa with Great British pride.